Freezing temperatures, rain and snow have torn into Lebanon’s refugee camps, leaving 70,000 trapped Syrians in dire need of shelter and supplies. 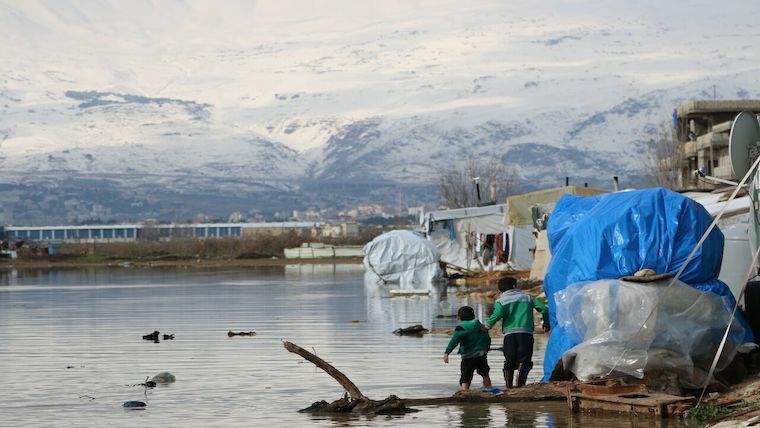 Two storms ripped through the Bekaa Valley in the past week, bringing relentless rain, winds and snowfall. Hundreds of refugee families were forced to abandon tents flooded with water and stinking sewage. The icy deluge destroyed the few belongings they had left. Winters are always harsh in Lebanon, but this year is very bad. Many families have suffered huge losses from the brutal weather and life in the camps has become near unbearable. We fear for all the children who are now forced to live in damaged, wet and unhealthy tents or have no shelter at all. Syria’s war has already robbed millions of children of their childhoods. And the conflict is far from over – even as we approach its eighth anniversary. Syrian refugees have already suffered so much and it is heart-breaking to see them suffer yet another blow. World Vision is scaling up its response in the Bekaa Valley and Akkar and is rushing vital supplies to desperate families. The charity has already reached 10,000 refugees in 28 informal tented settlements. We are distributing relief items like blankets, winter clothes and hygiene kits. We are also handing out tools to remove foul water and sludge from flooded tents and tanks.